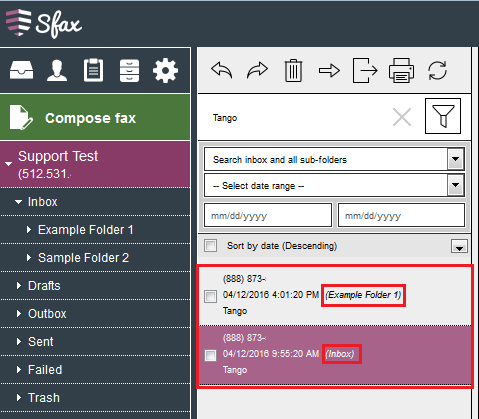 To sort your faxes for a specific folder, select the folder you would like to sort. 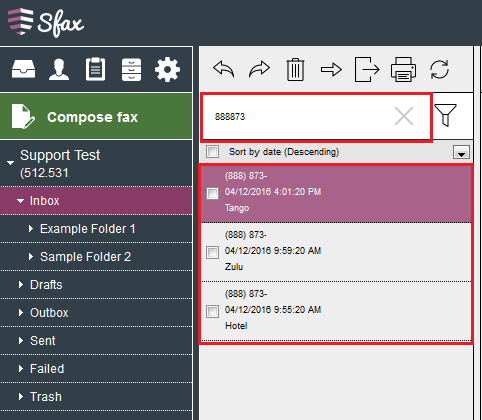 You can sort by date, fax number, subject or reference. 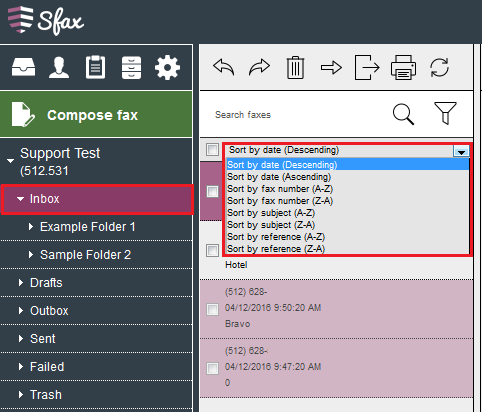 In order to update the subject and reference fields for the faxes, you received please go to Responding to your received faxes, and follow steps listed under Information about your received Fax. 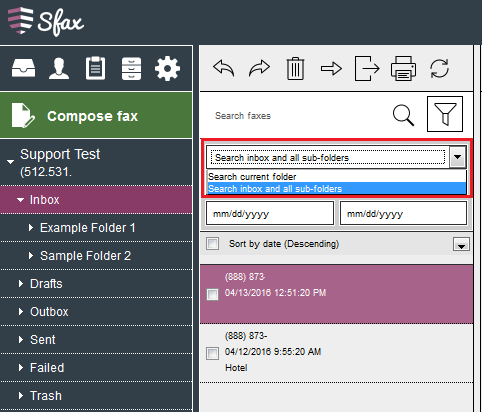 To search for a fax from a specific folder, select the folder you wish to search in. You will only be able to search the folder you currently have selected. From here you can use the Search faxes field or you can adjust the filter settings. To search by the number that the fax was sent from just type the number into the Search Faxes field. Once you begin typing the number the results will begin to show based on the numbers you have input. If you elect to adjust the filter settings select the Filter Icon and this will then display the options to select from. 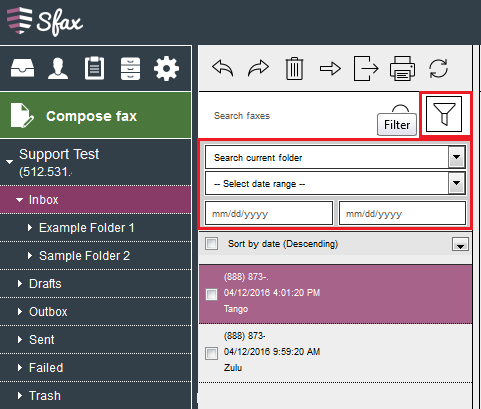 If you are selecting the Filter option for the Inbox folder, your folder search options will be Search current folder or Search inbox and all sub-folders. 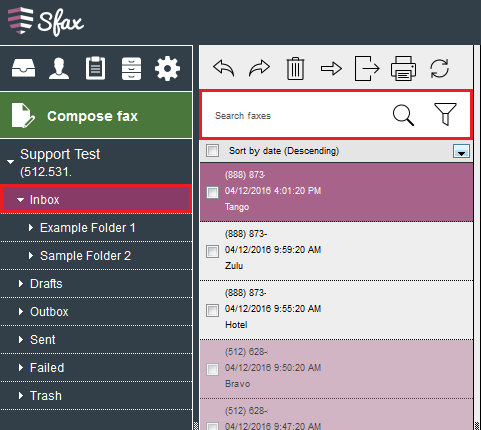 If you are selecting the Filter option for the Sent folder, your folder search options will be Search current folder or Search sent and failed folders. 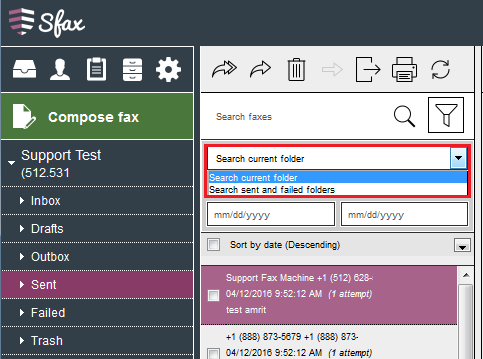 Once you select the folder options and enter your search term the faxes meeting the criteria will be displayed. 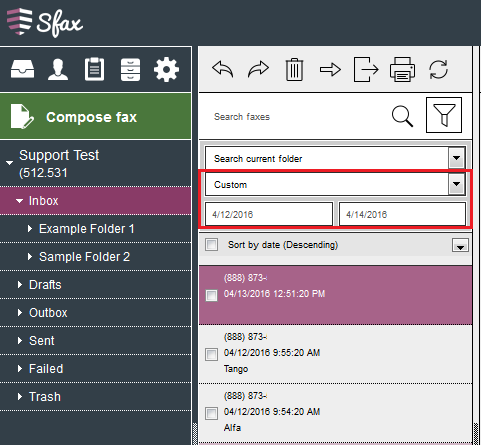 The folder name will be displayed in parentheses for each fax displayed. Once you select the date range this will display the dates and below the faxes meeting the criteria will be displayed. To select your own date range either select Custom from the drop down menu or just input the dates into the fields. If you input the dates the drop down will automatically change to display Custom.